Countdown is made from a black material covered in sparkles with a white head. He has black button eyes and a larger black button nose. 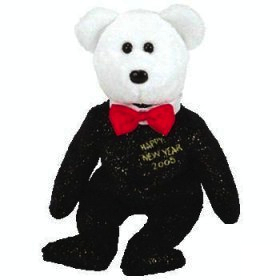 He wears a red bow tie and the words “Happy New Year 2005” are embroidered in gold thread on his chest. 2005 will be great fun! 2005 has good things in store! 2005 will sure be great! Countdown was released on 2nd December 2004. His birthday is on 1st January 2005. He is a New Year Beanie Baby bear. Countdown has one of three different swing tags counting down to the New Year. He retired on 31st January 2005.